When my flight from London to New York was cancelled, I was rebooked on a flight the following day, from a different airport. On my return, I claimed compensation for the cancellation. I’m sharing how I did this here, in case it’s helpful for you. This is what happened. The closer it got to our departure time, the more obvious it was to me that something was wrong. Our flight was scheduled to leave at 16.45 – but at 16.45 we were still in the departure lounge, with no sign of a gate number for boarding. The only message on the information board for our flight was ‘Next info at 17.45’. I was at London’s Gatwick Airport with a friend from Italy, and we were waiting for a British Airways flight to JFK. 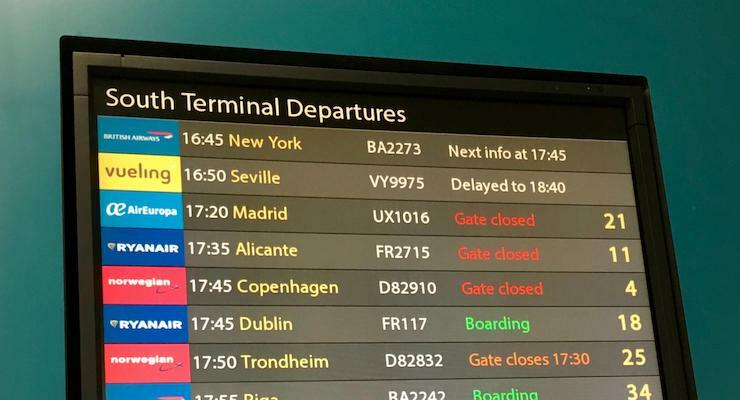 I’ve experienced a flight cancellation in the departure lounge once before, with Easyjet (I wrote about it in this post: What to do if your flight’s cancelled and you’re in the departure lounge). On that trip I was with my family, and working out how to get out of the departure lounge and finding a new flight was a chaotic and stressful process. I had an inkling that this flight was also going to be cancelled, and I was ready to react when a message appeared on the board telling us to go to the airline desk for information. My friend and I made our way there as quickly as we could. At the desk, two members of staff were explaining to a crowd of confused passengers that, sure enough, our flight had been cancelled. Apparently this was because there was a technical problem with the plane. We were told to make our way to a particular gate so that we could exit the departure lounge. From the gate we were escorted to passport control, then we went through the baggage hall and out into the arrivals hall, to find the BA check-in desks. We were travelling with just hand luggage, so we were able to make our way to the check-in area quite quickly – we were actually the first passengers from our flight to reach it. There we were told that we’d been booked onto another flight to JFK the following morning. The new flight was leaving from London Heathrow Airport, 37 miles from Gatwick by road. We were issued with new boarding passes and booked into a hotel close to Heathrow overnight, with dinner and breakfast provided. Coaches were arranged to take us from Gatwick to Heathrow. We were given bottles of water and food vouchers to use at the airport while we waited for the coaches. The hotel was fine, and we finally set off for New York early the following morning on a very full flight from Heathrow. We arrived in New York at last. I forgot about the flight and focused on more important things – like spending time with old friends, and exploring the city. It was a great trip, and you can read about it in my post New York City 6-day cultural itinerary. Back home, my husband suggested that I should apply for compensation for the cancelled flight. I looked on Martin Lewis’s trusty Money Saving Expert website for advice, and this led me to a very helpful website called Resolver. Resolver is a free online resource which helps you to make complaints and claim compensation from businesses and from public bodies. It explains your rights as a consumer, and it provides flexible email templates for you to use. I learnt that as my flight cancellation was the airline’s fault, and as it started in the EU (which the UK was still part of at the time), I was entitled to compensation – thanks to the EU’s robust flight regulations. Apparently, these regulations say that the level of compensation to be awarded should be calculated according to flight distance – amounts range from 250 to 600 euros. I set up a free account with Resolver, entered the cancelled flight details and used one of their email templates to make a claim to British Airways for compensation. The process was very straightforward. Nine days later I received an email (via Resolver) from British Airways apologising both for the delay in replying and for the cancelled flight, explaining why it had been cancelled, and telling me that I was entitled to 600 euros (which would be converted to sterling) in compensation. A couple of days later I received a cheque for £513. Although I was very disappointed to have lost a whole precious day of my trip, I understand that sometimes these things happen. I was impressed by the way that British Airways handled the cancellation, both at the airport and afterwards, when I made the claim. Resolver is an excellent, free resource which I’d definitely use again – although hopefully I won’t need to! Two last-minute flight cancellations are already enough, I think. 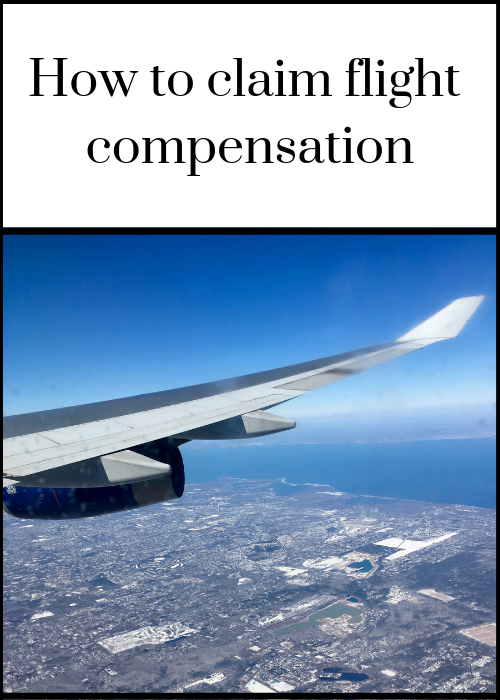 Have you ever claimed flight compensation? If so, how did it go? Once I got a severe delay with British Airways which caused me to miss my connecting flight, I seeked assistance from the staff to claim a compensation, but they informed that the delay is due to weather issues. However, I saw this ad from a flight compensation company called Skycop, who stated that sometimes airlines make false statements regarding the causes of disruptions, so I applied for a compensation through them, and to my surprise, I got a compensation of 400 euros from them in 3 weeks ! Would definetly reccomend !